To see what we get up to SARDA, have a look at these videos. Equine Assisted Therapy and Rehabilitation: The Horses’ movement is used in specialised techniques such as Hippotherapy. The movement of the Horse is used as a treatment tool by physical and occupational therapists to address impairment in individual clients. Riding for the Disabled provides therapeutic Horse-related activities for clients with physical, mental, cognitive, social or behavioural needs, for therapy. This includes riding, horse-mastership, and vocational skills. Hippotherapy: Treatment with the help of the Horse: Hippotherapy is a treatment technique in which the Horses’ movement provides a foundation of improved neuro-motor function and sensory processing that can be generalised to a wide variety of activities outside treatment. It does not teach specific Horse riding skills and is carried out by a Therapist and Horse handler who are trained and accredited as a team. The multi dimensional movement of the Horse provides an experience similar to that of the human walk. Horse riding externally manipulates the muscle groups required to walk, bend and sit up straight amongst others. As a therapy technique we find RDA programs do compliment other therapeutic techniques and help individuals towards recovery and independence. Programmes relate to the individual Rider’s needs and these needs are assessed by a team of trained personnel who are all Volunteers. The RDA programmes must take a holistic approach to the needs of the Rider. The RDA environment is supportive and safe allowing for achievement of individual goals. The opportunity at RDA for Riders to achieve in any endeavour is often a built in side effect to being a rider of an RDA Group. Increased Interest in the Outside World: For those confined by a disability, the world tends to shrink in size. Riding increases interest in what is happening around the rider, as the Rider explores the world from the back of a Horse. Even exercising becomes interesting when done on horseback. Increased Interest in One’s Own Life: The excitement of riding and the experiences involved stimulate the Rider, encouraging the Rider to speak and communicate about it. Improved Risk-Taking Abilities: Riding is a risk-sport. The Rider learns to master fears though the act of staying on the Horse, as well as attempting new skills and positions on the Horse. Development of Patience: Since the Horse has a mind of it’s own, the Rider learns patience as he or she attempts to perform skills on the Horse when the Horse is not cooperating. Repetition of basic riding principles also helps to develop patience. Emotional Control and Self-Discipline: The Rider quickly learns that an out-of-control Rider means an out-of-control Horse. Shouting, crying, and emotional outbursts upset the Horse, which in turn frightens the Rider. Riders learn to control these emotions and appropriately express them. Friendship: Although Riding can be a solitary activity, it is normally performed in groups. Riders share a common love of Horses and a common experience of riding – a good foundation on which to build a friendship. Development of Respect and Love for Animals: Horses require a great deal of care and attention. Riders find themselves bonding with the animals, developing an interest in them and learning to care for them – to put the Horse first. Increased Experiences: The variety of experiences involved in riding are endless. From tacking and grooming to trail riding, from going to Horse shows to learning the parts of a Horse, the Rider is constantly experiencing and growing. The Horse also provides the Rider with ability to go places otherwise inaccessible due to the disability. Enjoyment: There is no doubt about it, riding a Horse is fun. 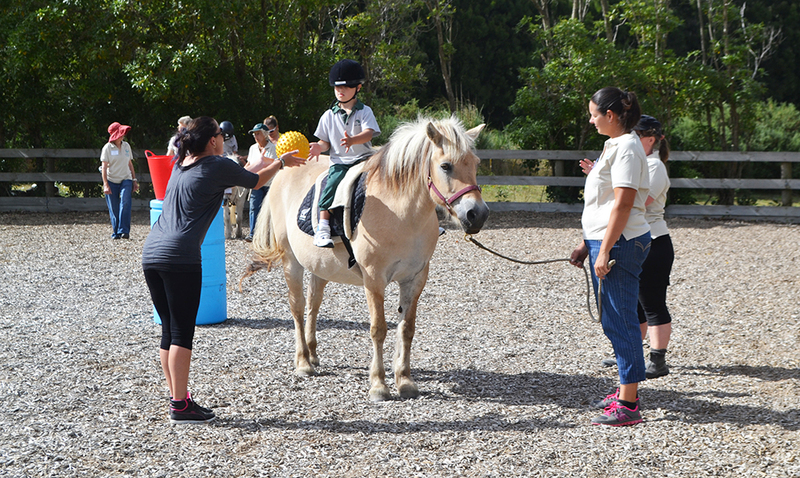 Riders experience excitement and pleasure every time they come for a lesson. Remedial Reading: Before one can read, it is necessary to recognize the difference in shapes, sizes, and even colours. These can be taught more easily on horseback, as part of games and activities. There is less resistance to learning when it is part of a riding lesson. Through the use of signs placed around the arena, letters can be taught, and reading of individual words by word recognition can also be learned. Games involving signs for “exit”, “danger”, “stop” etc., help to teach important life skills involving reading. Remedial Math: Counting is learned by counting the Horse’s footsteps, objects around the arena, or even the Horse’s ears and legs. Number concepts are gained as the Rider compares the number of legs on a Horse to the number of his own legs. Addition and subtraction are taught through games involving throwing numbered foam dice and adding or subtracting the numbers. Because the concepts are taught through games, resistance to learning is decreased. Sequencing, Patterning and Motor Planning: Something as simple as holding and using a pencil requires a great deal of motor planning. Knowing which comes first in a sequence of events is an important part of most activities. These and other similar skills are taught on horseback though the use of obstacle courses, pole bending, drill team, and many other games and activities. Improved Eye-Hand Coordination: Eye hand coordination is necessary for such skills as writing. These skills are taught in tacking the Horse, as well as various activities and exercises. Visual Spatial Perception: This includes our awareness of form and space, and our understanding relationships between forms in our environment. Included in this area are directionality (knowing right from left); space perception, which allows us to differentiate between items close in shape but spatially different (i.e.. “h” versus “b”); form perception (i.e.. differentiating “h” and “m”); figure ground (picking out an object from the background); and visual sequential memory (such as remembering symbols in a particular sequence or pattern). Both reading and math concepts involve visual spatial perception. Visual spatial perception improves as a natural result of control of the horse. Additional exercises are done on the Horse to increase ability in this area. Differentiation: The Rider learns to differentiate significant from less significant stimuli in the environment. An improvement in this area occurs as the Rider learns to attend to his Horse and those things that may influence the horse as opposed to attending the environment in general. Grey Lady gets my vote!! What a superb contribution to the wellbeing and enjoyment of the disabled. Thank you everyone for voting for Lady Grey so far. We are coming second so please keep the votes coming! Theyre all great but Lady Grey gets my vote?